Add Files: Select a single or batch of Media files from your PC and add them for conversion. 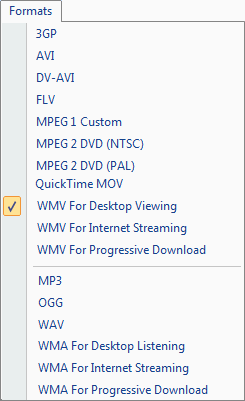 Search Media Files: Choose the folder and types of media files to search within this folder. Start Conversion: Select the file you want to convert from the conversion list and click on Start Conversion. Play Source: Plays the currently selected original source file. Play Converted: Play the converted file. Rename Destination File: By default the converted file will save with the same name as original. You can use a different name if you prefer. 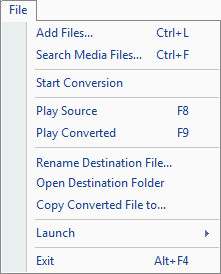 Open Destination Folder: Destination folder is where the converted files are saved. Select this option to go to the folder that contains all your converted media files. Copy Converted File to: Copy the selected files to the desired folder location. Edit Menu: Common conversion list related, file management features. Select All: Press Ctrl + A to select all the files from the conversion list. Unselect All: Unselects all the files from the conversion list. Remove: Remove the selected media file. Remove All: Remove all the media files present in the conversion list. Clear Status: Clear Status removes the current status of all the converted, failed or aborted files. Status of all media files will be updated and made pending. Formats Menu: Select output formats for conversion. Rip Audio CD: Rip your audio CDs to MP3, WAV, etc.